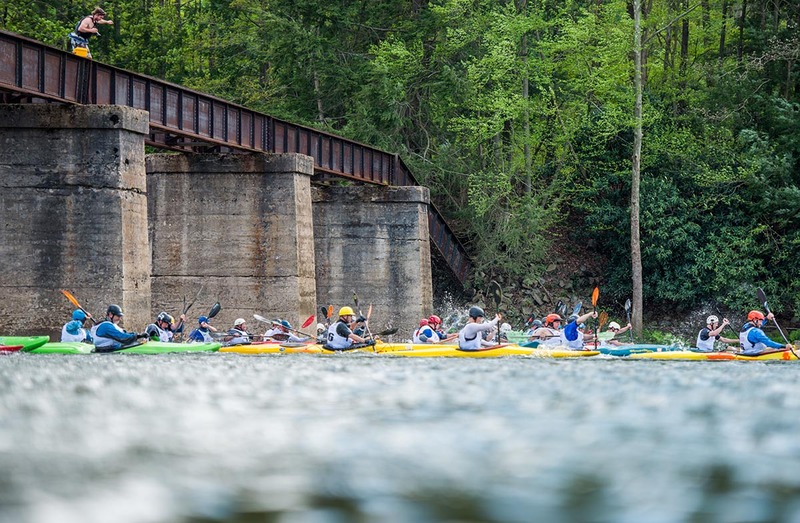 Registration for this year’s annual Down River Race – one of the largest mass-start whitewater races in the country – is open! On Festival Friday, racers cruise down 10 miles of gorgeous rapids through the Cheat Canyon; a remote and technical section of the river (paddlers should be confident navigating Class IV rapids with no support!) After the race, boaters celebrate with an after party on the festival grounds. Pre-registration includes festival entry on Friday and a race t-shirt, designed by Friend of the Cheat Harris Wright. We are thrilled to announce that the race will serve as a International Canoe Federation Ranking race! All proceeds from the race support the work of Friends of the Cheat, whose mission is to restore, preserve and promote the outstanding qualities of the Cheat River Watershed. Over the past 25 years, this work has included restoration of waters polluted by acid-mine-drainage from abandoned coal mines, as well as river and trail access projects, and citizen scientist initiatives. ONLINE early registration is now open! You are able to register using an online form and donate using Paypal. Early registration is cheaper ($30), and we set your selected T-shirt size aside for you. Save even more time by printing and filling out your race waiver before you arrive. Online pre-registration will close on Wednesday May 1st at midnight. Click here to learn more about the race.